This is one of those cooking apples which may perform reasonably well on soils where Bramley or Howgate Wonder fail to grow. It is a cooking apple which ripens before Bramley and will do well on cold, wet and slow-draining soil. However no fruit tree succeeds on permanently waterlogged soil. It will need some fruit thinning in early June in order to produce fruit of sufficient size. It is a green apple which, as it matures, slowly turns yellow. It is best not to keep the fruit later than November. It makes good apple sauce. As it flowers late, it is quite resistant to spring frosts. 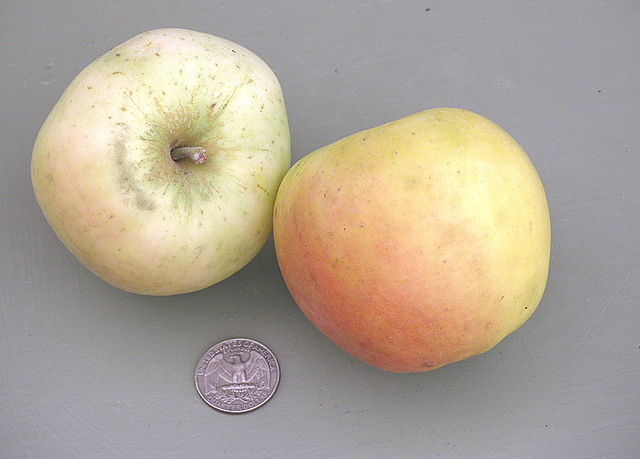 It is self-fertile and a good pollinator for other apple varieties.